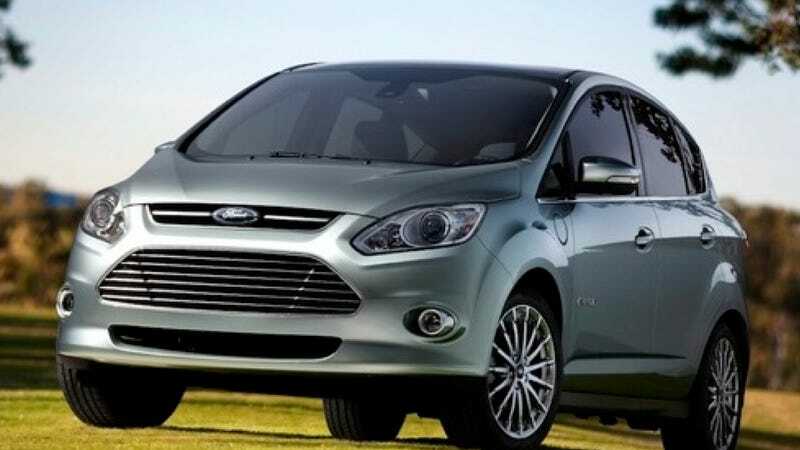 This fall, Ford will begin selling the C-MAX Energi, the plug-in version of its hybrid utility vehicle. Ford claims that it will be able to travel 20 miles in electric only mode, putting it ahead of the Prius plug-in and not far behind the much smaller Chevrolet Volt. Ford also boasts a 95 mpg equivalent fuel economy and a 550-mile overall range. Dearborn seems hell bent on dueling with with the Prius V, the rival Japanese hybrid automaker's minivanish ultility platform. After federal tax rebates C-MAX Energi is eligible for, the car will cost less than $30,000, slightly more than the lowest-priced plug-in Prius with an equivalent MPGe. C-Max Energi is only part of the Blue Oval's electrified offerings for 2013. The others will be Focus Electric, which will feature a 240-volt charging system and 110 mpg equivalent fuel economy around town; C-MAX Hybrid, which Ford expects will get 47 mpg city; Fusion Hybrid, which is also projected to get 47 mpg; and the Fusion Energi plug-in hybrid, which FoMoCo says will turn in a 100 mpg equivalent. Would you reverse your hybrid dislike for something like this? If you own a hybrid, does this interest you?